I’ve decided I would like to try out a couple of different programs that might help me spend more time writing on my blog and less time logging in to the different admin panels. One of my favorite pieces of software was w.bloggar, but I stopped using it when I couldn’t add tags and stuff with it. Maybe I just didn’t know all the tricks but the software seemed to limit what I could do in a way that the WordPress admin interface didn’t. I still like the idea of a consolidated area for my writing. I feel the same about my fiction. I tried out lots of different software, even writing a couple of books with different programs, but ultimately, I settled on one and imported all my fiction into it. 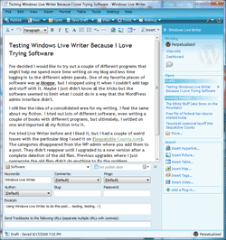 I’ve tried Live Writer before and I liked it, but I had a couple of weird issues with the particular blog I used it on. The categories disappeared from the WP admin where you add them to a post. They didn’t reappear until I upgraded to a new version after a complete deletion of the old files. Previous upgrades where I just overwrote the old files didn’t do anything to fix the problem. Anyway, I’m being brave here and giving it another shot. :-) So, there you go. This post is coming directly from Live Writer.